Dinner at Maison du Bez is a big deal. We love good food and we are convinced that a great evening meal is an essential part of any successful holiday experience. Many guests look forward to dinner all day, and with good reason. It is tradition at Maison du Bez to have very talented chefs and we are spoiled with arguably the best food in the valley. The cuisine is French/Swedish with influences from all over Europe. Every evening at 20h, all guests are invited to the rustic restaurant where we sit together at large tables on wooden benches. There we enjoy an exquisite three coursed meal served by the Bez team. Dinner is 28€ per person if you are not staying at the Ski Lodge, or if you want to invite friends from outside. Please be on time for dinner, as everyone eats as a group. Busy weeks we may not be able to accept outside bookings. Do check out the wine list, it has been carefully selected. When in doubt, ask for chef’s suggestion. The Bez-Team are good at serving you food and wine, but they are even better at skiing. Feel free to ask them for tips about where to go the next day. 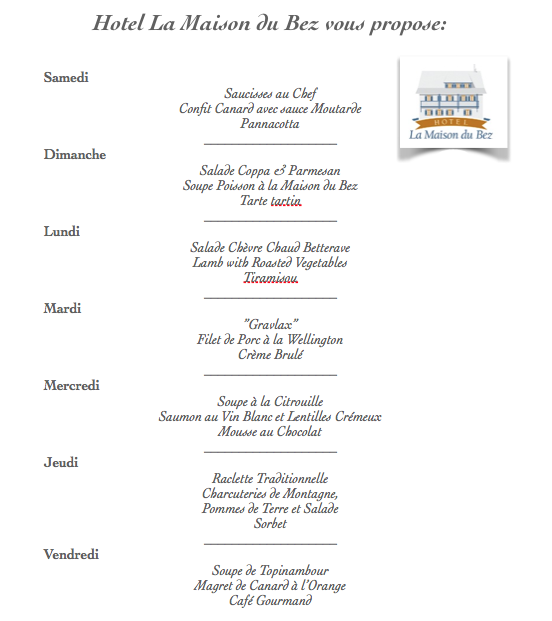 If you are lucky, you may get to ski with them..
See below for a sample winter menu. N.B, the Chef is at liberty to change the menu in any way he sees fit. Any special requirements should always be communicated both in advance via e-mail, and directly to the chef himself once at the Lodge. Bon Appétit!